Set up coupons/vouchers for clients to use when they make a booking. You need to select the coupon you want to use in calendar settings. Same coupon can be used in an unlimited number of calendars. Multiple coupons can be added to the same calendar. Step 1 - Click the "plus" button to add a new coupon. After you clicked the button, the coupon will appear in the list below. 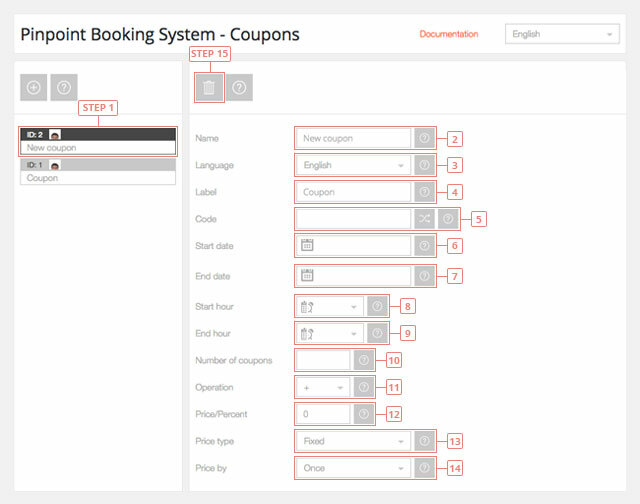 Step 1 - Select the coupon from the list to display the information. Field 2 - Change coupon name. Field 3 - Switch to the language you want to edit the coupon in. Field 4 - Enter coupon label. It will be visible to your clients. Field 5 - Enter coupon code. You have the possibility to generate a random code. Field 6 - Enter coupon start date, when the coupon will start being used. Leave it blank to start from today. Field 7 - Enter coupon end date, when the coupon will become invalid. Leave it blank the coupons have an unlimited time lapse. Field 8 - Enter coupon start hour, when the coupon will start being used. Leave it blank so you can use the coupons from the start of the day. Field 9 - Enter coupon end hour, when the coupon will stop being used. Leave it blank so you can use the coupons until the end of the day. Field 10 - Enter the number of coupons available. Leave it blank for an unlimited number of coupons. Field 11 - Select coupon price operation. You can add or subtract a value. Field 12 - Enter coupon price. Field 13 - Select coupon price type. It can be a fixed value or a percent from price. Field 14 - Select how to apply the coupon. The price can be calculated once or by day/hour. Button 15 - Delete coupon.